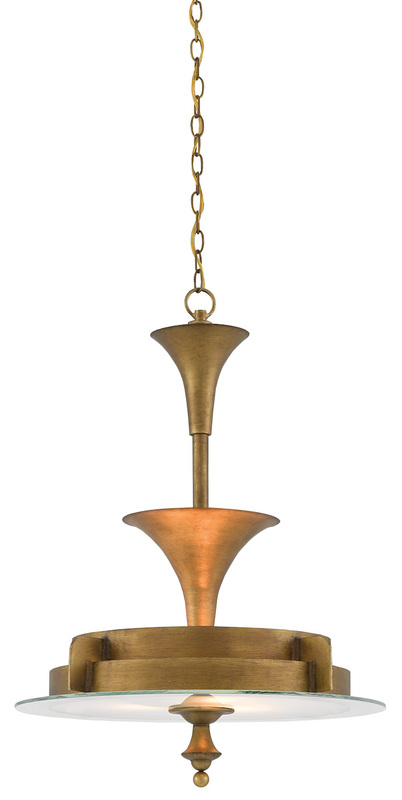 Next week is the spring edition of High Point Market and while I won’t be attending, one of the debuts I will be sorry to miss is the new Bunny Williams Lighting collection for Currey & Company. Bunny has often incorporated Currey fixtures in her work and when designing the 2015 Southern Living Idea House in Charlottesville, VA, Currey generously donated all the lighting fixtures. It was then they started a dialogue about creating a collection together. The new collection of 15 fixtures, with more to come down the line, offers many additional sources for a stylish and properly lit room. 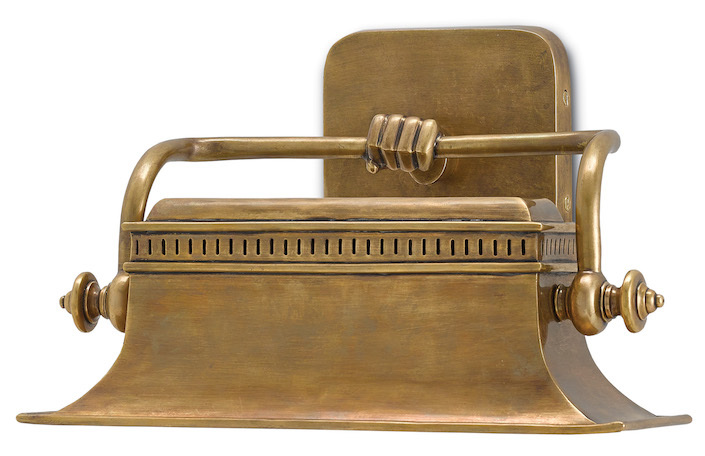 Like many of Bunny’s collections, her inspiration is often derived from antiques she has found and used over the years. The Berkeley Chandelier, top, with its hand painted finish, is inspired by an antique Swedish bed corona that hangs in Bunny’s office. 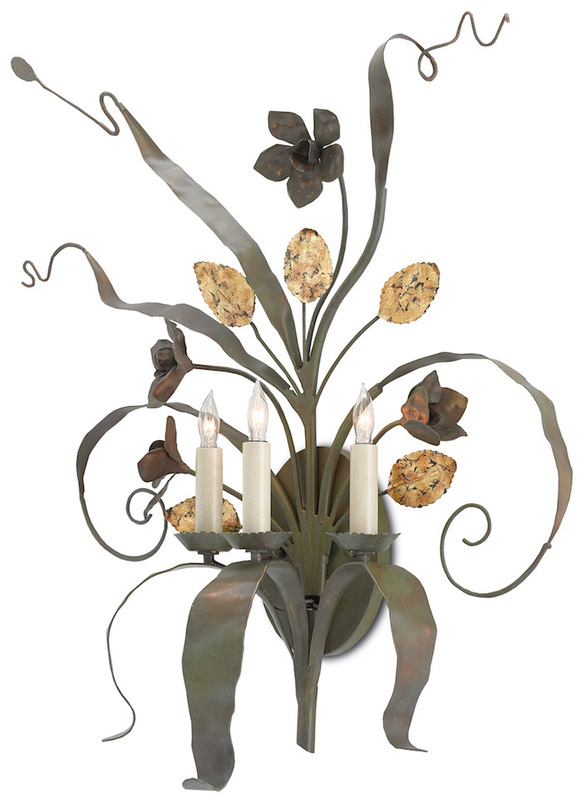 And the charming Malvasia Wall Sconce, above, with its whimsical hand detail, was based on a fixture Bunny found on a recent shopping trip in Georgia. As Currey is family owned, they offered Bunny the opportunity to be involved in every aspect of the collection – from original development, CAD drawings and finish inspections to the creation of the High Point showroom display for the Bunny Williams for Currey & Company collection. And with operations around the world, they are able to work with a wide variety of materials to create products that have an artisanal one-of-a-kind feel, perfect for Bunny’s aesthetic. The Willow and Westley wall sconces, for example, above and below, both inspired by antiques Bunny bought for clients, are hand forged. Bunny is an avid gardener, and like the sconces above, the Bette Chandelier below references nature with its rope tied bundle of leaves, a stylish way to bring the outdoors in. Just like Bunny’s design style, the collection is eclectic. 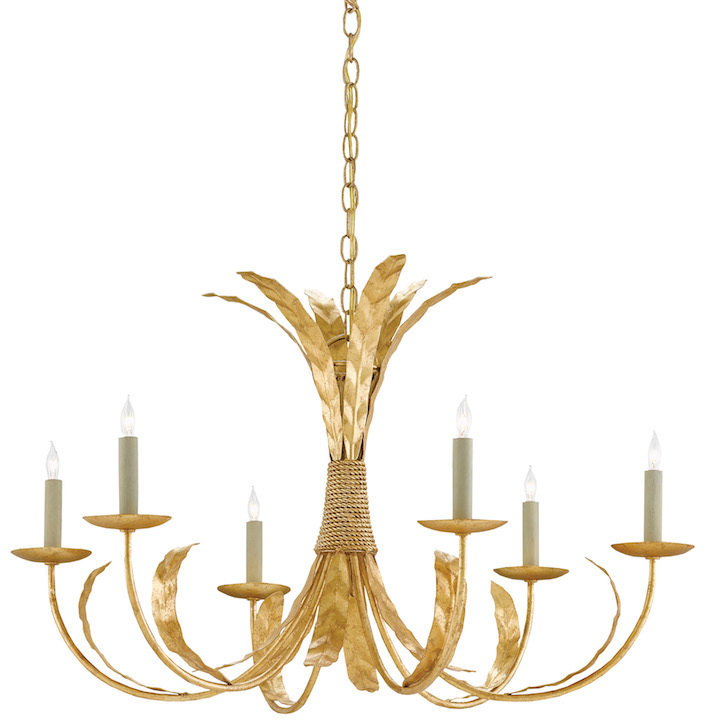 So while the two sconces above are country chic, the fixture below adds a low key dose of glam with its gilt finish. 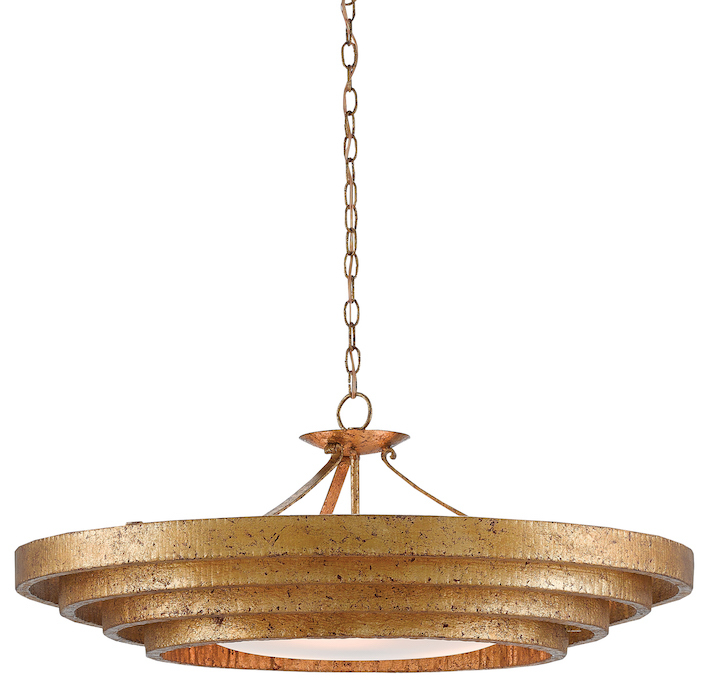 while the sleek brass Art Deco styling of the Brighton Chandelier is perhaps destined for a more glamorous setting. One of my favorite fixtures, the Weslyn Wall sconce, walks the line between the two – a nature inspired design with glamorous detailing. Bunny loves, as do I, the juxtaposition of the plaster carving with the gilt base. The type of fixture Bunny has often found more difficult to source were large-scale flush (or semi-flush) mounts. 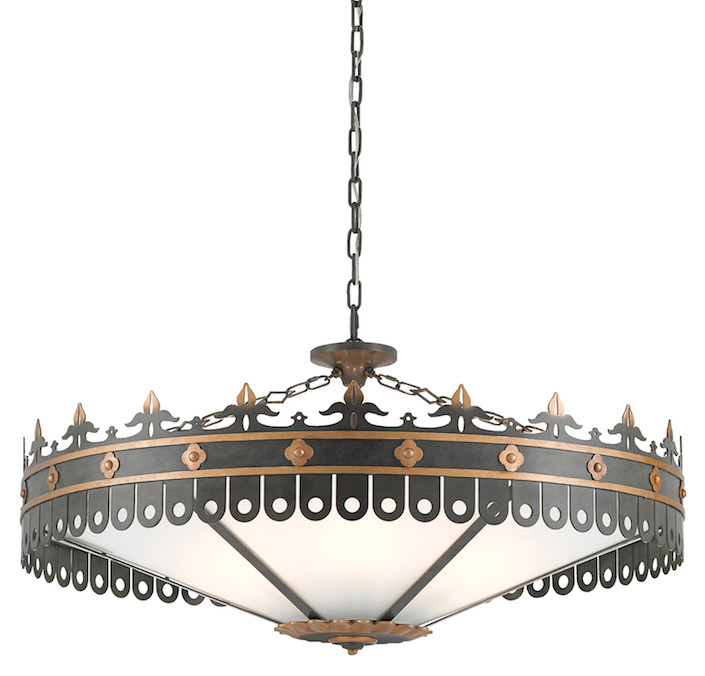 Smaller ones, suitable for powder rooms, mudrooms or hallways abound but larger ones appropriate for living, dining rooms or even bedrooms are scarcer so several of hers are adaptable for those circumstances, such as the Belle Chandelier, below, which can be hung without the chain. Congratulations to Bunny and Currey. 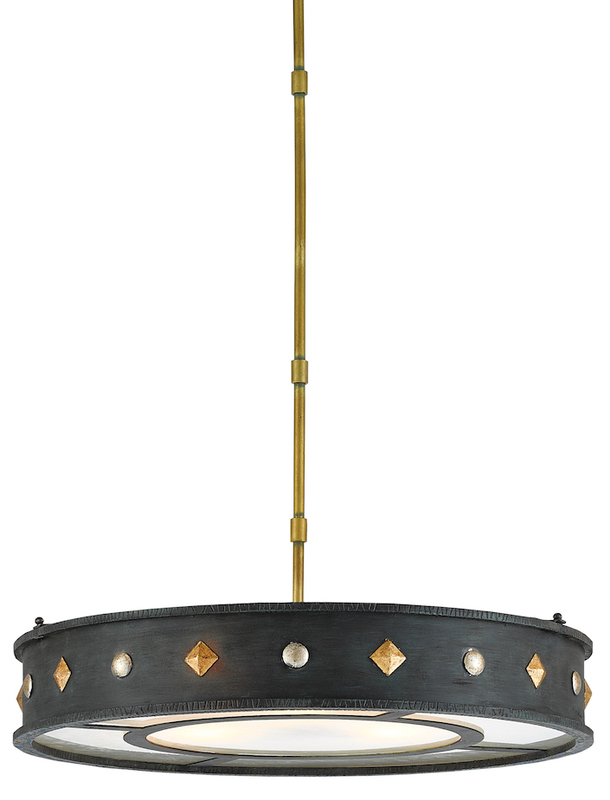 If you happen to be attending market, be sure to stop by and see the Bunny Williams Lighting for Currey & Company collection. It’s centrally located and always a hopping showroom with great programming where you will be able to experience the full collection in person! This entry posted in design, interior design, lighting. Entry Tags: Bunny Williams, Currey & Company, High Point, Lighting Bookmark the permalink. 81 queries in 0.414 seconds.